It might not be a palace coup, but a changing of the guard is in progress at Pentagram New York and San Francisco that has far-reaching implications for the American design community. When Colin Forbes, one of the Pentagram’s founding partners and former director of the New York office, started planning for his eventual retirement, his primary goal was to ensure continuity by transfusing new blood into aging partnership. The introduction of younger partners (now in their 30s and 40s) – Woody Pirtle, Paula Scher, Michael Bierut and Jim Biber in New York, and Kit Hinrichs, Neil Shakery and Lowell Williams in San Francisco, all respected designers in their own right – was a smart long-range business move for Pentagram, but more important, it signalled that the babyboom generation of designers has come of age. Just as the election of Bill Clinton, the first American president to have protested against the Vietnam war and smoked (although not inhaled) marijuana, signals the demise of the Washingtonian old guard consisting of Second World War veterans, so the new guard at Pentagram broadly heralds a new era in American design: a basic shift from Modernism to pluralism. Change is inevitable and generally welcome, but even as we celebrate it, we must also take time to reflect upon what will be gained and lost as America’s design leadership passes the baton to a new generation. What are some of the obvious differences between old and new? The old guard comprises designers who earned their stripes during the 1950s and 1960s and are still active – such figures as Milton Glaser, Seymour Chwast, Saul Bass, Ivan Chermayeff and Tom Geismar, Ed Benguiat, George Tscherny and Massimo Vignelli (the extremely active eminence grise, Paul Rand, is the only member of the old guard with direct ties to the 1930s European Modern tradition). The new guard emerged in the 1970s and 1980s and has worked up through the ranks. The old guard is dominated by men; the new includes a large proportion of women, best illustrated by the 1993 American Institute of Graphic Arts Communication Graphics Show jury chaired by April Greiman and made up entirely of women with the notable and token exception of Vignelli. The old guard represents two very distinct design traditions, Modernism and eclecticism; the new is a confluence of many styles, but adheres to few ‘isms’. The old guard upholds a certain standard rooted in past verities; the new embraces some of those verities, but has routinely shunned the design canon. Of course, American graphic design has been gradually building upon distinct philosophic and stylistic foundations since the Second World War, when the scions of the Bauhaus and proponents of the Swiss style captured the ‘academy’ (i.e., the American Institute of Graphic Arts) from the classicists involved in book design. These pioneers proffered economical and functional communications as an antidote to the clutter and ugliness which typified most pre- and post-war mainstream commercial art, and transformed graphic design from a service to a profession rooted in art. However, a subsequent rebellion in the mid-1950s by even younger designers against the oftimes spartan Modernist methodology produced a sophisticated eclecticism, an attempt to reconcile past and present through the synthesis of old and new graphic forms. 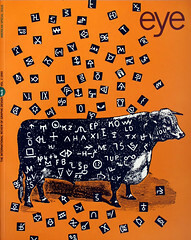 During the 1950s and 1960s the dominant American graphic design style was a mixture of Modern and eclectic approaches, typified on the one hand by Paul Rand’s and Chermayeff and Geismar’s rationalist corporate identities and on the other by Herb Lubalin’s and Push Pin Studio’s decorative advertising and editorial illustrative design. At the risk of oversimplification, American graphic design was governed by these approaches because their pre-eminent practitioners chaired the competitions. The first hint of a meaningful challenge to their hegemony occurred in the mid-1970s, when a new generation began to subvert the canon. Influenced by typographic experimentation at schools in Basel, London and Amsterdam, so-called post-modern (po-mo) graphic design reared its head as Punk, Swiss Punk, New Wave, Pacific Wave, Deconstructivism, as well as Soviet-, Bauhaus- and vernacular-retro. These styles were supported by an array of emerging technologies, and influenced by the introduction of theories of semantics and semiotics into the curricula of schools such as the Rhode Island School of Design and Cranbrook Academy of Art. By the early 1980s diversity was the rule, but despite various surface conceits, the new approaches had one thing in common: clutter. A sense of chaos that the Moderns had rejected decades earlier was no reappearing as a critical response to different cultural and social stimuli. But though the most progressive designers received attention for their ‘breakthroughs’ in an increasing number of annuals and shows, in the marketplace they were at first commissioned only by clients for whom such approaches had symbolic value. Nevertheless, by the mid-1980s, thanks to the concerted, often risky, efforts of adventuresome designers (and their patrons), the roof was ready to burst off the hothouse. A new gospel of anything goes (in the name of progress and fashion) was being spread by design preachers and their acolytes. Raucousness – at time excessive – epitomised 1980s American graphic design. Young designers working in fashionable styles became overnight stars, while designers who seriously tested accepted limits produced theories that suggested there was more to design than met the eye. Yet despite the serious experiments and silly shenanigans carried out in the name of change, the active members of the old guard kept their positions of prominence during the 1980s. In the 1990s, however, younger firms with fashionable reputations are taking more and more of their clients, in part because veteran design buyers are retiring and the preferences of their younger replacements are moulded by current trends, and in part because many younger clients harbour often unfounded fears that the old guard command excessively high fees and hold prima donna attitudes. Old guard designers are having to compete as never before to keep existing clients and to get new work. Some veterans have bitterly decried popular new trends as blips in the history of design and affronts to the sanctity of Modernist standards. Paul Rand lambasts dedicated followers of fashion as ignorant; Massimo Vignelli writes of Emigre typography as ‘garbage’. No less heated, but not as public, are the views that design is dying as its priorities shift from an emphasis on form and aesthetics to more general social concerns. Changing ideas and ideals have certainly had an impact, but even more important is the American designer’s growing ignorance. Time’s inevitable toll combined with chronic cultural (and professional) Alzheimer’s have contributed to the first generation of students (in my experience) not to know the names, even if they know the work, of Milton Glaser, Seymour Chwast, Massimo Vignelli and Paul Rand. Young blinkered professionals and revisionists who believe the old guard has received too much attention already contribute to this malady. Yet during the 1980s and 1990s graphic design history has been taught more seriously than ever before. Clearly its lessons have not always had positive effects. Historical analysis can sometimes pre-empt an active career by locking its subject in a time capsule. However, the clearest explanation for the present changing of the guard is time itself. The once rebellious avant-garde has become the status quo, and as new principals move into positions of influence, the old canon is re-evaluated, challenged and reformed. ‘In every age of well-marked transition there is the pattern of habitual dumb practice and emotion,’ wrote Alfred North Whitehead in Adventures of Ideas (1933). The challenge for the current makers of change is to avoid dumb habits; to maintain equilibrium between the valuable aspects of our tradition and the needs of today. That is what took place when the old guard was new, and will no doubt occur again when the new guard turns old.